Pivot Table Formatting for Excel (AutoFormat for Pivot Table) is an Excel add-in to facilitate the application of customized styles and formatting options for Excel pivot tables. Formats applied to Excel pivot tables ca be saved a templates and then later used to gain efficiencies for future pivot tables or distributed within an organization to provide consistent look and feel to reported data. Ability to quickly create and apply advanced custom formats for any Excel pivot table. Pivot table layout is unaffected as fields are not moved and no information is added or removed from the pivot table report. Ability to apply several custom formats to one pivot table. Group custom pivot table formats for logical access and application. Pivot table areas (i.e. page, row, column and data field) formats are saved and restored whenever the layout of the pivot table is changed. Export formatting and style templates for use by other users. Import custom formatting and style templates from other users or locations. Compatible with all versions of Excel 2010 32-bit, 2007, 2003, XP (2002) and 2000. 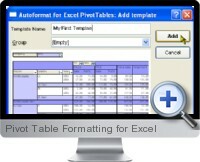 Pivot Table Formatting for Excel is also available at a discounted price in the Excel Add-ins Collection Download.